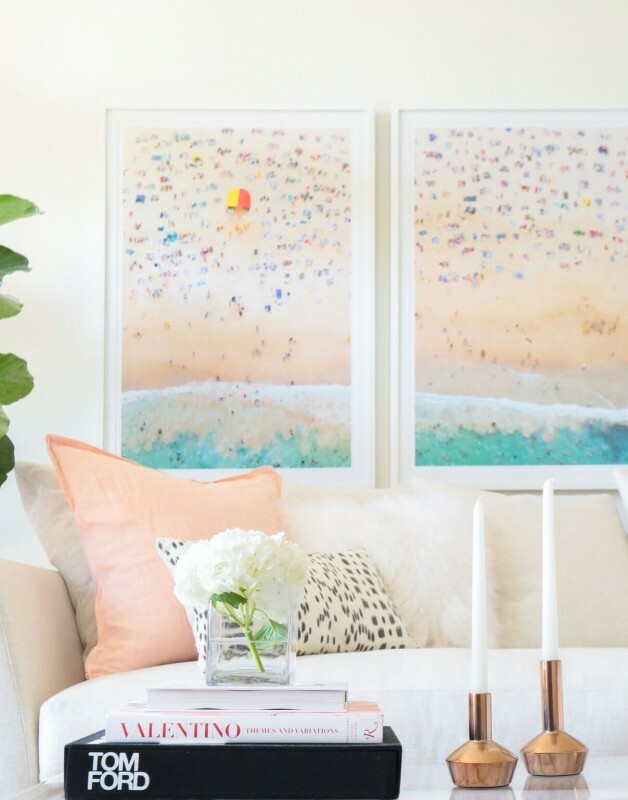 Today's Inspiration Spotlight, Marianna Hewitt, is a fun one because I had the opportunity to meet with her and her interior designer, Amber Lancaster, a couple months ago when they stopped by the studio. Marianna was in need of a piece of artwork that would add that pop of color to her living room. Naturally, I was happy to help! Learning more about Marianna, she told me about herself and lifestyle. "I live in LA but lately I've been spending most my time in airplanes and hotels, will travel for photos! I'm a full time blogger and YouTuber, as well as a TV Host. Luckily for me, work and fun are one in the same so you can find me eating at a new restaurant, visiting a new destination or shopping... all while documenting it on Instagram." "I keep my home in a pretty neutral palette and I like to feel relaxed at home. Modern isn't for me. As beautiful as modern designs are, I always want to walk into a space that feels like home. It should feel clean, comfortable and homey. That is exactly the types of rooms I am drawn to. I love to sit on my couch and be in a relaxed environment so the plushier, the better." 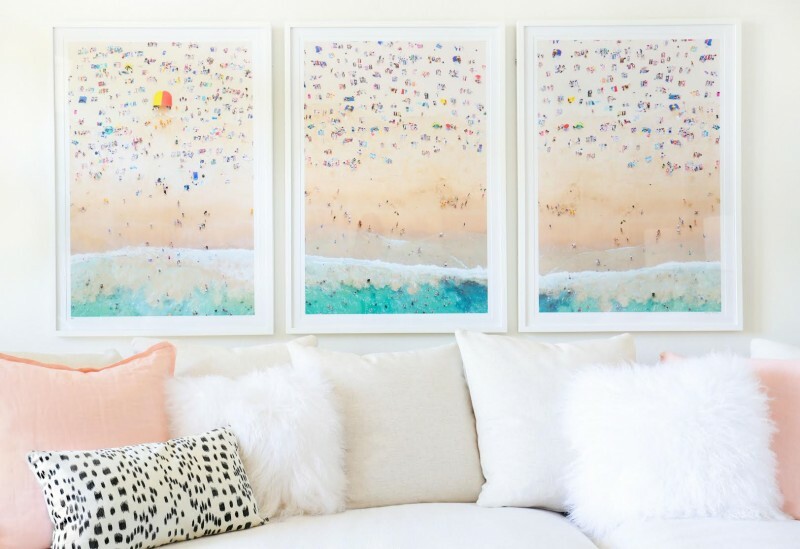 Knowing she'd need a pop of color for this comfy zone, I began showing her a selection of beach aerials from my A la Plage collection. Regardless of which colors Marianna migrated towards, I knew there was quite a variety for her to choose from in A la Plage. Marianna and Amber also let me know that they were looking for a larger scaled piece, which would act as the center piece for the room over Marianna's couch. Hearing this, I immediately suggested a diptych or triptych, which I think is such an interesting way to maximize an open space with framed art photography. "Every new photo Gray creates, makes me wish I was there. If its Italy or Palm Springs, I instantly feel the need to jump into the photo. I love the aerial shots of umbrellas, the playfulness of the balloon letters and how all of the prints all stick with Gray's aesthetic." but they ultimately landed on the Coogee Beach Triptych, which after seeing the final product, I must say was an excellent choice! "On my couch. After being away from home so much, I love to sit in my living room and catch up on Netflix and order Seamless. Very glamourous." Ha! Well, I am thrilled to know that she enjoys her down time with a piece of Sydney Beaches with her for all of her lounge loving moments! 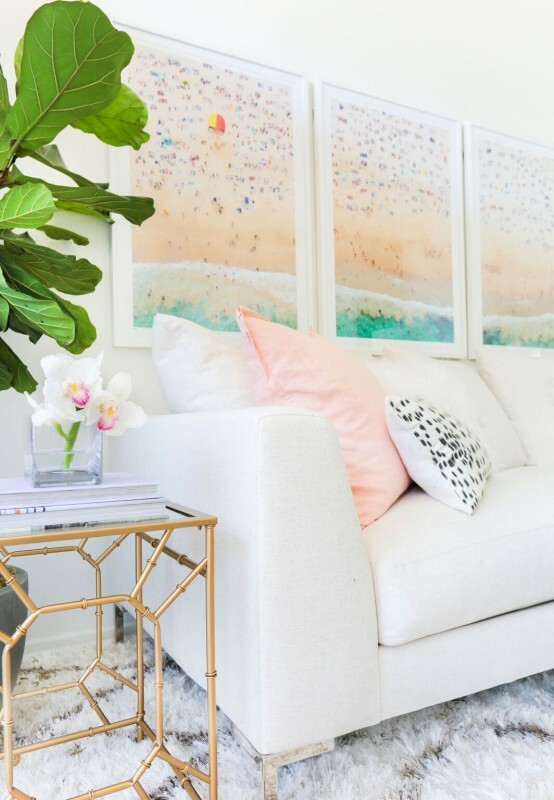 Thank you so much to Marianna Hewitt for sharing your home with us, and I hope you all have enjoyed a peek into her beautiful yet welcoming home. If you'd like to see more from Sydney Beaches, then wait no further...you can see them all right here.